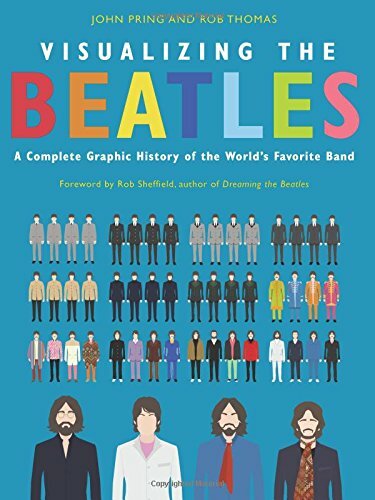 In one of the early chapters of this handsome book—as visual and colorful as a magical mystery tour—the authors have a double-page spread titled “Before the Beatles.” It details all the different bands John Lennon, Paul McCartney, George Harrison, and Ringo Starr were in before the four lads solidified as the Beatles. Even the casual Beatles fan will have heard of the Quarrymen and Rory & the Hurricanes but wow—who ever knew John and Paul were in The Vikings (1958) or briefly called themselves Johnny Gentle & His Group? And all this information is displayed via an easy-to-read infographic, and it’s at once detailed, easy to absorb and fun! And that, by the way, is the takeaway from this book. It’s at once detailed, accessible, and loads of fun. In page upon page, the rich visuals captivate the eye and almost obscure all the detailed information the authors are delivering. It’s kind of like stuffing spinach inside a plate of macaroni and cheese but much more palatable. A page called “The Pedals” depicts and highlights the relatively few guitar pedals the Beatles employed in making those ground breaking albums. There are other pages on the boys’ hairstyles, their fashions, mustaches, facial growth. If you can draw it, the authors provided it here. They say some people just sponge up more information visually than verbally and, if that’s you, then this book is perfect. One can also imagine parents and grandparents buying this book for their offspring to get them up to speed on the world’s best band. It is surprisingly encyclopedic given its modest 288 pages. Want to know which chord ended “A Day in the Life?” The number and titles of the Beatles American albums (which, if you didn’t know were different than the band’s British LPs)? Who wrote which songs on each album and what musical keys those songs were written in? This book is unique and lives up to its promise. A wonderful gift for the casual or serious Beatles fan.